Home / Look what I bought today! My brother is a cruel man. He gave me a gift certificate to Think Geek for Christmas. $40. Which is awesome, until you realize that $40 is the sweet spot where so much is possible, but only makes you want more. Think Geek is like crack for, well–geeks. I was originally going to buy the LOTR One Ring earrings. They’re awesome and sleek and nifty and could be a subtle way of getting my geek on while surrounded by squares. But, there’s a ring on a chain as well. And you can’t have one without the other right? And then I did the math. Ouch! So my dream of owning the One Ring and riding around on one of those spectacularly spooky horses was dashed. 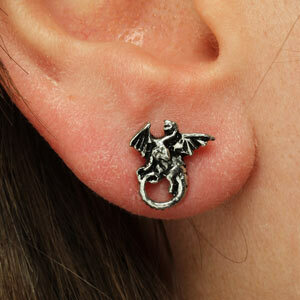 There’s another dragon wrap-around earring that will probably end up in my shopping cart some day. But I really found it hard to justify that too! (By that, I mean that spending over $100 in one fell swoop on something that is completely unnecessary made my financial nerves quiver in fear.) 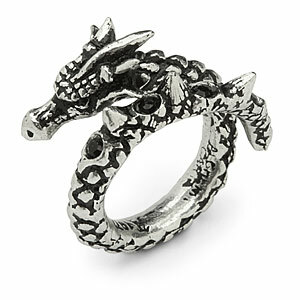 So, for now, I am waiting with bated breath for my dragon wrap-around ring and my baby dragon earrings to arrive.